The Pokémon Company International. Need we say more? 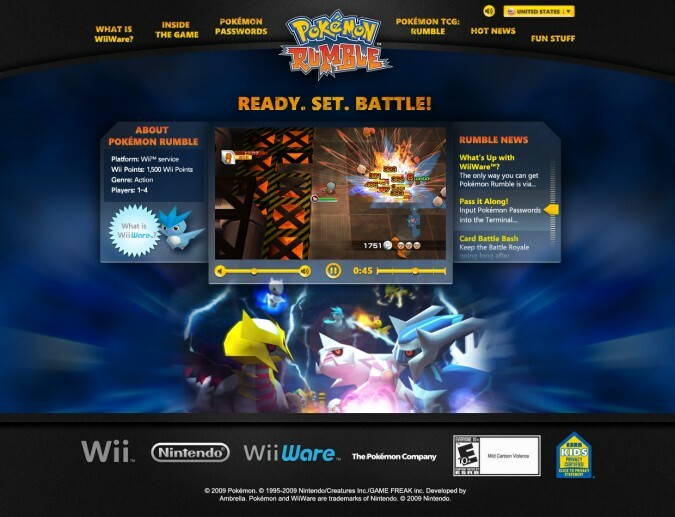 Challenge: In less than 5 weeks… Design, develop and implement a highly immersive site, online game, and marketing materials showcasing Pokémon Rumbles’ unique game play—clearly conveying the perfect “pick up and play” game. In 9 different languages. Yowza! Solution: Wii owners and Pokémon fans are used to nothing short of fantastic. The bar was high for creating a site with stunning graphics and fun interactive interplay. Utilizing cutting-edge digital media including game video, intense animations, a mix n’match online game, screensavers, wallpapers, a targeted Email campaign—and a little bit of magic mixed in—we designed a site and supporting marketing materials for this project. It was bold, intense, energetic, and an experience which was fun, colorful, exciting, and action-spurring…especially surrounding game purchase. Result: A truly exquisite experience as fun as the actual game. Winner of the 2010 IMA Award, Best-in-Class and 2011 Outstanding Achievement WebAward.